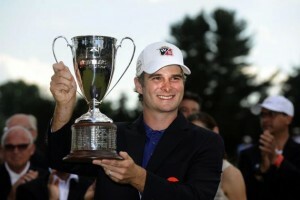 A recent trend has begun to develop revealing the secrets to winning The Traveler’s Championship. We all know that to win on the PGA Tour you must have unbelievable consistency, endurance, mental fortitude and the skills required to beat the best in the world. We can now say that there is one more requirement to become a winner of the Traveler’s Championship. Have Your Caddy Play Indian Hill Country Club! For the past three years the winner’s caddy has played at The Hill before or during the Tour Event. 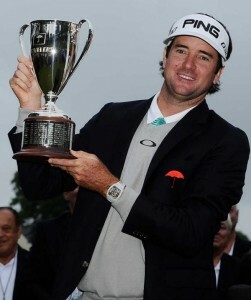 Do you think that it is just a coincidence that Bubba Watson’s caddy has played at IHCC for the past few years and has 2 victories under his belt? Maybe. Last year we were visited by quite a few players and caddies. Among them was the looper for Kevin Streelman. After playing at The Hill, Mr. Streelman began to climb the leaderboard and surpass all of his fellow competitors. Another coincidence? Possibly. So that leaves us with the tale of Ken Duke. His caddy stopped by to play during the week of the tournament. He enjoyed his round and headed back to his hotel. Little did he know that he had just discovered the best kept secret on the PGA Tour…. Play Indian Hill Country Club. *This does not constitute a guarantee. The only guarantee we will offer is that you will be playing a beautiful golf course and the hidden gem of Connecticut private golf. This entry was posted in Golf Course, Recent Events. Bookmark the permalink.